Findings: Intraaxial mass in the left cerebral hemisphere which signals slightly higher than CSF and effaces the body of the corpus callosum (cc). Post operative changes in the overlying calvarium (a). 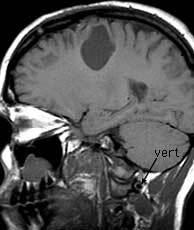 Left vertebral artery (vert). Obliquus capitus inferior (oci). First cervical vertebral body (C1). 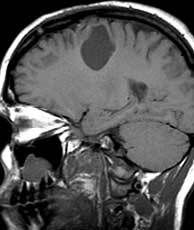 Left occipital condyle (con). Obliquus capitus superior (ocs). Semispinalis capitus (ssc). 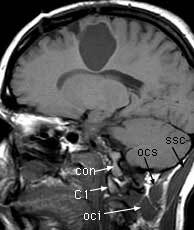 Superior cerebellar cistern (scc). 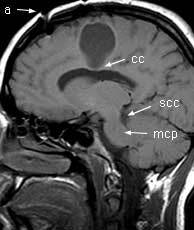 Middle cerebellar peduncle (mcp).